*Please keep it away from water even the copper wire led is waterproof. Water can get inside the bottle. 100% QUALITY GUARANTEE 30 DAY BACK MONEY GUARANTEE - Please rest assured that you have made the right purchase. If you have any questions in use,you can contanct me at any time. ENVIRONMRNTAL PROTECTIO AND ENERGY SAVING:No Battery Require, A solar panel on the top, 100% Solar Powered,The Best Choice For Environmentalists, generally charge in the sun 5-6h will light up 6-8h,slide the switch to the "ON" position, Long lasting LED bulbs,little heat,safe to handle even after long-time use. HIGH QUALITY :Cool White More Pure, Quiet, Noble,Cool. 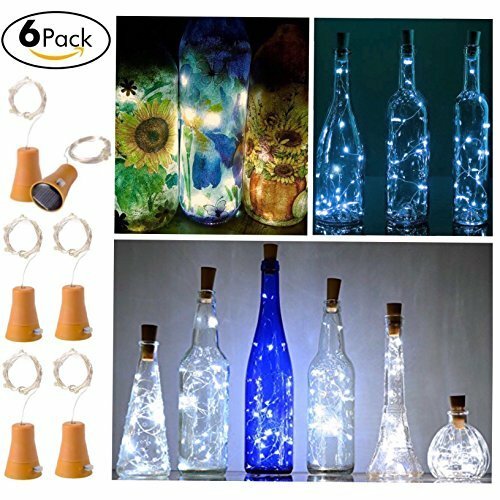 Enough copper wires length to decorate any you want .All copper wires are bendable and flexible too, you can make any shape you like or warp on bottle easily.And the wire lights are waterproof, so it will be absolutely safe if you want some water in the bottle. (The cork is not waterproof). CONVENIENT- THERE IS NO COMPLEX SETTING. Only one button to switch on/off. Absolute high quality that provides enough brightness and long time of working .A built-in light sensor ensure that it turns on at dusk and turn off by dawn automatically. 100% QUALITY GUARANTEE 30 DAY BACK MONEY GUARANTEE - Please rest assured that you have made the right purchase. We are pretty confident about the quality of our solar lights for wine bottles. If you have any questions about this product by Ninite, contact us by completing and submitting the form below. If you are looking for a specif part number, please include it with your message.